The Epistle to the Galatians is a book of the New Testament. It is a letter from Paul of Tarsus to a number of early Christian communities in the Roman province of Galatia in central Anatolia. It is principally concerned with the controversy surrounding Gentile Christians and the Mosaic Law within Early Christianity. Along with the Epistle to the Romans, Galatians is the most theologically significant of the Pauline epistles, and has been particularly influential in Protestant thought. Ironically, although it was intended to unite Jews and Christians, it later became the basis for Christians separating themselves from Jews, and even persecuting Jewish Christians who continued the practice of circumcision. Paul preaches to the Gentiles. The churches of Galatia were founded by Paul himself, together with Timothy and Silas. 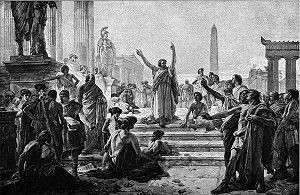 (Acts 16:6) These communities seem to have been composed at least partly of converts from paganism, although both Jews and "God-fearers"—Gentiles who accepted the One God and associated with Jewish synagogues, but not as full members—were also involved. After Paul's departure, the churches were visited by individuals whom Paul regarded as troublemakers preaching a "different gospel" from that preached by Paul. (1:6–9) The Galatians were receptive to the teaching of these newcomers, and the epistle is Paul's angry response to what he sees as their willingness to turn from his teaching. 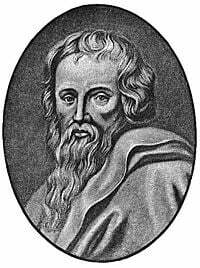 The opponents against whom Paul battles are known today as Judaizers, teachers who insisted that in order for Gentiles to be accepted into the Christian community, they must become Jews. This meant not only accepting the moral laws of Judaism, such as the Ten Commandments, but also being circumcised. Prior to Paul and Barnabas' mission to the Gentiles, nearly all members of the Christian movement had been Jews. Thus, many in the Judean churches—who saw Jesus as the resurrected Jewish Messiah—understood that belief in Jesus and his teachings could only be practiced by people willing to live as Jews, just as Jesus did. The letter indicates a particularly heated controversy concerning circumcision, Sabbath observance, fellowship between Gentiles and Jews within the Christian community, and the Mosaic Law. Galatians addresses the basic question "Was the Mosaic Law binding on Gentile Christians?" The epistle is designed to counter the position that acceptance of Jewish ceremonial law—especially circumcision—was an essential part of following Jesus. In chapter 1 Paul defends his apostolic authority. (1:11–19; 2:1–14) He insists that his words are just as binding as any other apostle's, even though Paul himself did not follow the living Jesus in his earthly life. Paul also admits that he personally opposed the early Christian movement. Paul's gospel was not taught to him by men, but by a "revelation from Jesus Christ." Thus, he declares: "Even if we or an angel from heaven should preach a gospel other than the one we preached to you, let him be eternally condemned!" In chapter 2, Paul explains that he was at first distrusted by the Judean church. However, three years after his conversion, he went to Jerusalem. There he met none of the other apostles except "James, the Lord's brother." Then, after 14 years he returned to Jerusalem to meet with a larger group to discuss how the gospel should be properly preached among the Gentiles. Paul may be describing the so-called Council of Jerusalem of Acts 15, although the accounts are not easy to reconcile. There, Paul was opposed by certain "false brothers"—probably the members of the Jerusalem church from a strict branch of the Pharisees, as reported in Acts 15:5, who insisted that Gentile believers be circumcised. Paul sees himself as the apostle to the Gentiles, while Peter had been sent to the Jews. Paul names James, Peter, and John—in that order—as the "pillars" of the church and declares that they agreed entirely with him. However, at Antioch, where Paul and Barnabas had established a sizable community, certain "men from James" came from Jerusalem and stirred up a major controversy. The issue was no longer whether Gentiles had to be circumcised, for that question had already been settled. Rather, it was whether Jewish Christians and Gentile Christians could share table fellowship with one another. The "men from James" insisted that Jews were not allowed to eat with Gentiles, while Paul insisted that Jews and Gentiles were one family in Christ. The other Jews in the congregation—including both Peter and Paul's companion Barnabas—ended up siding with the "men from James," with the result that Paul publicly opposed Peter "to his face." 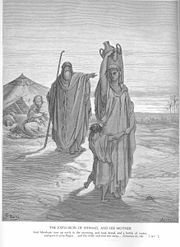 The exile of Hagar: In equating believers in Jesus with Sarah, and Judaism with the rejected Hagar, Paul laid the foundation for Christianity as a distinct religion which viewed Jewish tradition with disdain. In chapter 3, Paul gives the theological basis for his stance: "The law was put in charge to lead us to Christ," he explains, "that we might be justified by faith. Now that faith has come, we are no longer under the supervision of the law." Instead, we become children of God through faith in Jesus. He concludes with a famous passage: "There is neither Jew nor Greek, slave nor free, male nor female, for you are all one in Christ Jesus. If you belong to Christ, then you are Abraham's seed, and heirs according to the promise." In chapter 4, Paul again takes up his diatribe against the Judaizers, saying that "Those people are zealous to win you over, but for no good." He uses the analogy of the biblical women Sarah and Hagar and their sons, Isaac and Ishmael, as figures of Christian freedom versus Jewish enslavement to the Law of Moses. In a passage declaring Christianity's ultimate estrangement from the Jewish religion from which it sprang, he invokes Genesis' order to "get rid of the slave woman and her son" (Genesis 21:10) and declares: "We are not children of the slave woman, but of the free woman." Finally, in chapter 5, Paul throws down the gauntlet and absolutely forbids the circumcision of Gentile Christians. "If you let yourselves be circumcised," he declares, "Christ will be of no value to you at all... you have fallen away from grace." At the same time, he cautions against taking Christian freedom too far, for one must indeed struggle against the "sinful nature" by following Judaism' basic moral commandments, if not its ceremonial law. Among the sinful acts Paul lists to be avoided are: "sexual immorality, impurity, debauchery, idolatry and witchcraft, hatred, discord, jealousy, fits of rage, selfish ambition, dissensions, factions, envy, drunkenness, and orgies." Paul concludes his letter by encouraging his readers to be vigilant against evil and "do good to all people, especially to those who belong to the family of believers." He ends with a note written in his own hand—as opposed to the rest of the letter, which was apparently dictated to a scribe—reminding the Galatians that: "Neither circumcision nor uncircumcision means anything; what counts is a new creation." Virtually all scholars agree that Galatians is one of the most certain examples of Paul's own writing. The main arguments in favor of the authenticity of Galatians include its style and themes, which are common to the core letters of the Pauline corpus, and the historical connection to Acts of the Apostles. Moreover, Paul's description of the Council of Jerusalem (Gal 2:1–10) gives a different point of view than the description in Acts 15:2–29, whereas a forger writing in later decades would most likely have stuck close to the account in Acts to convince his audience that this was an authentic writing by Paul. The central dispute in the letter concerns the question of how Gentiles could convert to Christianity, which shows that this letter was written at a very early stage in church history, when the vast majority of Christians were Jewish or Jewish proselytes. There is no hint in the letter of a developed organization within the Christian community at large. This puts it during the lifetime of Paul himself. 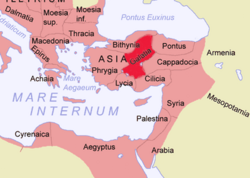 Galatia was a Roman province in today's Turkey. On this map, the Mare Internum is the Mediterranean Sea. The Acts of the Apostles records Paul traveling to the "region of Galatia and Phrygia," the latter lying immediately west of Galatia. It is probably to these churches that the Epistle to the Galatians was addressed. There are two main theories about when Galatians was written and to whom. The North Galatian view holds that it was written soon after Paul's second visit to Galatia (Acts 18:23), during his "second missionary journey." The visit to Jerusalem, mentioned in Gal 2:1–10, seems identical with that of Acts 15, and it is spoken of as a thing of the past. In this view the epistle must have been written after the Council of Jerusalem. Also the similarity between this epistle and that to the Romans has led some to the conclusion that they were both written around the same time, namely, in the winter of 57-58 C.E., during Paul's stay in Corinth (Acts 20:2–3). The letter to the Galatians, however, was written urgently in harsh language with little systematic thinking, while the letter to the Romans is a more deliberate and systematic treatise, in exposition of the same fundamental doctrines. This argues for Galatians being written before Romans. The South Galatian view holds that Paul wrote it during his first missionary journey, when he traveled throughout southern Galatia. This theory makes the letter quite early, perhaps 48 or 49 C.E. In this view Galatians may be the first of Paul's extant letters, even predating Thessalonians. With the exception of Romans, the Epistle to the Galatians is probably the most significant of Paul's surviving letters, in terms of historical impact. Indeed, many of its "shoot-from-the-hip" arguments make for better short quotations even than Romans, although Galatians is far less theologically sophisticated. As far as the controversy with the Judaizers is concerned, ultimately, Paul's attitude on the circumcision issue carried the day. Christianity would not be a Jewish sect that believed Jesus was the Messiah, but would become a separate religion in the Roman Empire, appealing mainly to Gentiles. Later, Paul's letter was used effectively by those in the Christian church who believed that Christianity should have little or nothing to do with the Jewish religion and people from which it sprang. During the Spanish Inquisition, this attitude led inquisitors to consider the circumcision of children of Jewish converts to be evidence of insincerity and heresy, a crime punishable by death. During the Protestant Reformation, Martin Luther and other reformers used Galatians to emphasize the principle of sola gracia—salvation by grace alone rather than Catholic "legalism" and "works" of penance. For Luther, there could be no compromise of Galatians' assertion that we are "justified by faith" alone, even if the Epistle of James had insisted on the exact opposite, that man is justified by works, not faith. Finally, to church historians, Galatians provides some of the New Testament's most useful information regarding the early church. Since it covers some of the same material as the Book of Acts—sometimes confirming it, other times seeming to contradict it—Galatians serves as a means of establishing confirmed facts about early Christian history. On the other hand, it also exposes fascinating differences of perspective and opinion between Paul—who sees himself as absolutely right and people such as the "men from James" and even the Apostle Peter as dead wrong on the issue of table fellowship—and Acts, which many critics believes tends to smooth over the differences between James, Peter, and Paul. ↑ This account, too, does not entirely square with Acts' version, where Peter, not Paul, is the first to have preached to the Gentiles. ↑ Acts, however, indicates that James insisted that Gentile Christians must not eat meat that had been strangled and must refrain from "blood"—two kosher dietary rules that hardly square with Paul's insistence that Jewish ceremonial laws do not apply to Gentiles. Acts also indicates a stipulation that Gentile Christians must not eat food sacrificed to idols, an issue which Paul deals with in chapter 8 of 1 Corinthians. All links retrieved May 18, 2017. History of "Galatians, Epistle to the"
This page was last modified on 18 May 2017, at 14:48.